Spring is here, and there no sign it's spring like pain and suffering at the brutal Quad Rock 50 and 25 mile race here in Fort Collins, Colorado. Gnar Runners truly challenges the bravest of ultra runners who dare to enter this race. As a trail "marathon" it falls short of the renowned 26.2, but more than makes up for it in over a mile of cumulative vertical ascent. Going for the 50? The cut-off is pretty stiff at 14 hours and will have you fighting the mid-day heat. At this point we're about a week out, so what can you do now that you haven't already done? On race day there's plenty you can do to improve your outcomes. Obviously hydration and nutrition are important. Drink lots, eat early and often, but I won't waste your time on the obvious. Something also obvious, but rarely followed-through with by runners is pacing. Start slower than you anticipate. You can always pick it up later in the race. It's called "smart-racing" for a reason, and early high levels of adrenaline can sabotage your race. One of the most important things you can do, is save your energy for when you'll need it most. If you're using a heart-rate monitor, it can be a helpful measure of effort, but subjective effort suffices for most. If tackling this much climbing in a race is new to you, or if you're attempting a new distance, you need to know how to modulate your pace during the ups and downs to maintain a consistent effort level. The more variation of effort level and heart rate, the less efficient your body is utilizing your energy, and the more likely you will bonk hard. If the trail starts to steepen, and you don't slow down, it can spike your heart rate, forcing you to slow down much more and wastes valuable glycogen stores (stored carbs). Something to practice on your few short and easy runs before the race, is to work on maintaining a consistent effort and heart rate while running at different levels of incline. Learn to look ahead and anticipate the changing terrain and how you might modify your pace before hand. Most people taper too hard and too early. Tapering is an effective performance enhancing technique where a runner will overreach in their training efforts a few weeks before the race, then reduce mileage leading towards the race. If done correctly, in theory, your performance on race day will be more than 100%. The problem is that most people taper incorrectly (rest too much), and more people diminish their race performance than people who do it correctly. If you're not sure exactly how to taper, then you're better off just doing the same you would usually do, just a little bit less, and a little bit slower. After the race, many of you will fall into "post-race depression". This is a real thing, usually cured by impulse-registering for another race, or running again before your body is ready for it. Depending on how long you've been a runner and your genetics, you might be able to jump back into it, but most of us shouldn't. Post-race junk miles can turn into a long-term injury. After a race of this magnitude, your body needs repair, inflammatory markers are high, and there are signs of muscle breakdown and sometimes chemical signs similar to a heart attack (not to worry, your heart is most likely just fine). Focus on strengthening exercises and low-impact cross-training after the race, your body and future fitness will thank you. "Be conservative on the first lap, because the way back in is much steeper, hotter, and will almost certainly take you much longer. Make sure you take enough water with you from the Arthurs aid station to the turn around, and from the turn around back to Arthurs. It's a long haul and if you depend on the water jugs that are cashed midway, you are setting yourself up for failure if they are empty or get tipped over. Take the extra second to get cooled off at the Horsetooth aid station on the way back. The ascent up to Towers is south facing and exposed, a little water on the head and back can keep you running/ hiking instead of crawling. There are 6 major climbs, don't focus on the climb that you are on, always be thinking about what pace is sustainable to set you up for success on all the climbs in front of you. Smile and enjoy the ups and downs :)"
"Last year, I had the most amazing time at the Quad rock race in Fort Collins. My not-so-secret recipe for Rocking the Quad Rock? Register to the race with a bunch of your friends! You’ll be thrilled to see everyone when you turnaround! Take the time to smile at everyone that runs by and make the most of it. What really worked for me was to power through the runnable downhills. You can gain some solid ground on the downhills if you make a conscious effort to accelerate with the downhills and let gravity do the work. I would try to “relax” as much as I could on the uphills. This was also a good strategy for last year’s race because it was really hot! I made a conscious effort NOT to get my temperature to rise on the uphills, by staying relaxed and of course icing as much as I could at the aid stations! The important thing however, is that you utilize your strengths to move efficiently. If you are more of an uphill runner and running downhills hard really fatigues your legs, that’s ok too. Just make a conscious effort to push the uphills! I find it really helps to split the course in this way, because your short-term goal is always to push through either the uphill or the downhill section that you find yourself in. You no longer see the race as a 50 mile race but rather a sequence of ups and downs! Most importantly, you are in the mountains, embrace the scenery and savor every second of it." "One piece of advice I would give is to be ready to climb and descend. Much of the race is either going up the mountain or down the mountain. Be aware of making sure you eat and drink enough too. The trails get warm and there can be little airflow. I remember getting very hot on the way back. Look forward to a great and fun finish. If you have saved your legs enough, you get to fly down the last mountain and then there is a pretty flat single track taking you to the finish! It’s a challenging and fun race! It’s called Quad Rock for a reason." "Quad Rock is a beast of a race. You're always going up or down. The 50 mile race can be brutal, while the 25 mile race is harder than any marathon you'll find. What sets Quad Rock apart from other races is the climbing and the weather. When ascending the three or six major climbs it's important to keep your effort under control. If you're heart rate rises too high you might not recover from it before the finish. It's better to walk when you reach the steeper sections of the trail or when your effort is too high (i.e. gasping for breath). Everybody in the race, from the winner to the final finisher, will be walking at some point. There's a lot of walking in ultras. As a spring race, nobody is really acclimated to the heat yet, and Quad Rock always has the possibility of really hot weather. If it's hot you will not be able to run as fast, so plan accordingly, and don't be discouraged if your time is a little slower than you would ideally like. That will be the case for nearly everyone. Heat can exacerbate problems with eating, drinking, and electrolytes, so take care of these things before they become race-ending problems. If you're in the 50 mile race you will reach the start/finish area at mile 25 and be faced with the choice of turning around and going back out, or dropping out of the race. The easy choice will be to stop. Don't make the easy choice. Do what you need to do at that aid station and get back on course as quickly as you are able. The longer you linger at this aid station, the less likely you are to get back out there. Of course, if you are injured or sick, that's another matter." "Start slower than you think you need to. Quad Rock = "Quads ROCKED" be mindful with all of the climbing and descending. "Ultrarunning is 90% mental, so I focus on that. I tell myself, "this is what I signed up for; this is my goal...just keep putting one foot in front of the other". I tell all of the negative voices to be quiet. Have a positive mantra. I find it helpful to write those mantras on my arm or hand to remind myself." 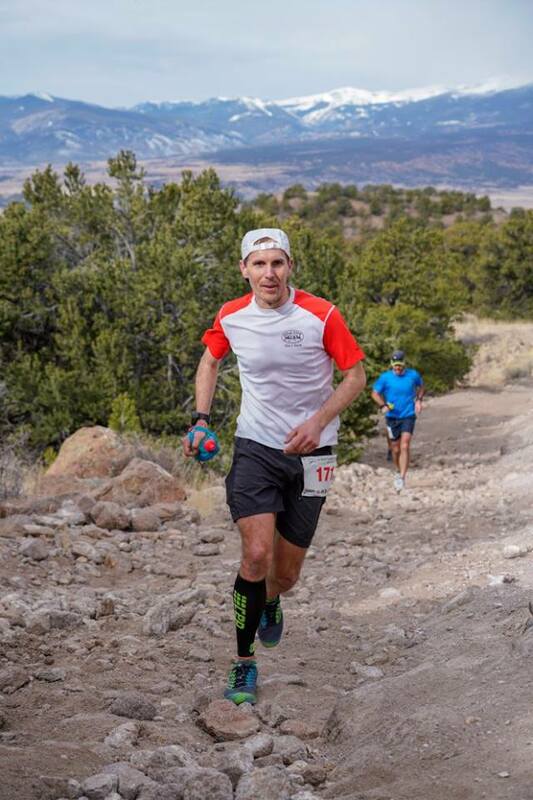 "My one piece of advice (particularly for the 50 milers) is hold back in the first half of the race. There are six climbs, and in my opinion, the toughest are the last two. Those climbs come late when you're tired and when it may be quite warm. The last climb is very exposed, too, making it that much warmer. So focus your pacing, hydration, and nutrition on being strong for the second half of the race. It can easily cost you an hour or multiple hours in the back half of the race if you don't race smart in the first half."